The Color Bar keeps 4 selected colors available at any one time. The outlined box is the current color that will be used to paint with for most brushes. Some brushes use all 4 colors from the color bar. Additionally some filters and some tools make use of the current colors. Right click on a color box to popup the option menu. The Set to Current Color menu item will copy the current color to the clicked color box. The Swap with Current Color menu item will swap the current color with the clicked color box. 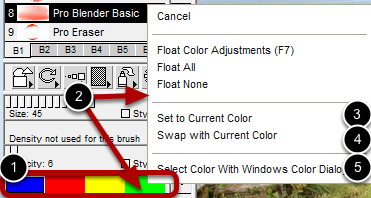 The Select Color With Windows Color Dialog menu item will allow setting the color with the Standard Windows color dialog.